Nothing measures your success in the gym better than the raw numbers you can bench press. Lifters compare one another by how many wheels are on the bar, and even your friends who don't train inquire about how much you can bench. Whatever that number is, inevitably it's not enough. In all your efforts to push more weight on the bar, progress is ultimately measured in the smallest 2.5-pound plates. What you need is a strategy that's going to make dramatic gains—up to 50 pounds—on your bench in just eight weeks. It's a big-picture, strategic approach rather than one that simply entails trying to bench as much as you can each time you show up at the gym. I was 14 years old when I attempted my first max bench press. I threw up 205 pounds at a bodyweight of 170—not too bad if I do say so myself. By the time I graduated high school, I had three wheels on each side of the bar, and it took only a year or two of focused training in powerlifting to finally hit 405 pounds. I found it even more challenging to get up to a "raw" 500, but last month I did it! What were the methods that allowed me to break that barrier? Here are the three most important techniques I used for a herculean bench press. You may be strong at the top or the bottom of the lift, but as you press the bar there is inevitably a point along the path where the bar reaches a "sticking point." This is where you have the least amount of mechanical leverage, and you're at your weakest. I want you to strengthen yourself at the sticking point first. You can do this with a board press, or in a power rack using the adjustable safety bars. Here's what's going on: When you lower a weight in a controlled manner, the working muscle is stretched and it builds up "elastic" energy. When you reverse direction, that built-up energy helps you power through the initial phases of the lift. As you press the bar there is inevitably a point along the path where the bar reaches a "sticking point." This is where you have the least amount of mechanical leverage, and you're at your weakest. But what if you eliminate the elastic energy so you have to work harder out of the hole? Using boards or safeties allows you to momentarily rest the bar on the supporting object, thus releasing the elastic energy. Ever start an exercise in the stretched position and noticed how the first rep is always the hardest? That's because there's no elastic energy to aid the first rep.
Now, if you were to use boards or safeties to set the bottom of the range of motion precisely to your sticking point, you could focus your training on that area of your strength curve in which you're weakest and eliminate as much elastic energy as possible. Anywhere from 1-5 boards can be used, though I recommend staying around 2-3 most of the time. This range targets the area where most people "stick." I also usually recommend an overemphasized pause on the board press to ensure all the energy to lift the bar has to come from the working muscles. That way you'll get no recoil whatsoever. Focus on increasing your strength at your sticking point and eventually you'll be able to do more reps with a heavy weight and increase the amount of your max bench. Of the many factors to be accounted for when training for power development, one of the most often missed is acceleration. If you want more power, you must use heavy weights and you must learn to move them fast. Bands or chains work off of this principle. 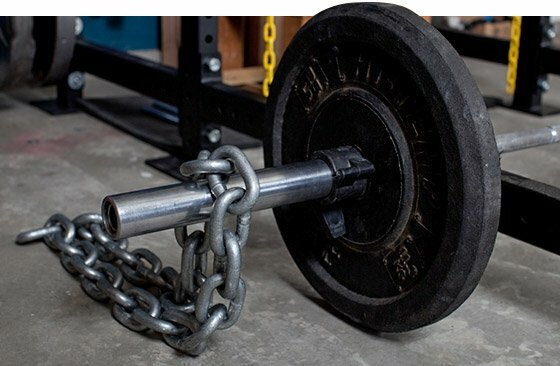 A barbell loaded with 360 pounds is the same weight both at the bottom and top position, but when bands or chains are applied properly, the level of resistance increases as the weight moves up. This accommodating resistance requires you to apply more force to the bar during the concentric contraction, teaching you to push hard and fast. Bands or chains can be applied on lighter days to develop speed strength or on heavy days to develop maximum power output. The bands we use in the accompanying workout come in two lengths: 41 inches and 12 inches. Our instructions will be for the longer bands as they're much more common. Bands come in a variety of thicknesses, allowing you to easily adjust the load. These range from an average resistance of 40 pounds all the way up to 200 or more. Unless you're lucky enough to have a bench press with installed band pegs, you'll have to set up a base to wrap your bands around. The most common setup is to use dumbbells as a base. You wrap the bands around the dumbbell handles and back up to the bar. Make sure your dumbbells are heavy enough to keep the bands down! Also, you may need to put a small plate next to the dumbbells to keep them from rolling away. Most lifters loop their bands just inside or outside the collars on the barbell they're pressing. An alternative setup is to bench press inside a power rack. The bands can then be looped either along the frame or on a pin at the lowest setting. Regardless of your band setup, make sure there's tension at the bottom of the lift, and that you don't exceed the recommendations and overstretch the bands. I recommend that you load about 20 percent of your load from bands. So if you're benching 225, a pair of mini-bands should give you about 30-40 pounds of resistance at the top of the lift. Load 185 in straight weight with the bands in place to provide an appropriate load for max-effort work. 3. Use A "Sling Shot"
The Sling Shot is a wearable apparatus that supports your elbows, keeps everything tight, and allows you to overload your bench press through the entire range of motion with a weight heavier than what you could normally handle. It may just be the greatest tool I've ever used for bench pressing. With the Sling Shot, I grew accustomed to using a weight 10 percent above my max, so that when the time came for me to make a raw attempt—meaning, without the Sling Shot—I crushed it. The Sling Shot stores some of that elastic energy as you lower the bar to your chest, helping you accelerate and explode up with heavy weight. It also reduces stress on your shoulders and elbows. People who have "bencher's shoulder" and other types of shoulder pain typically have no issues using a Sling Shot. 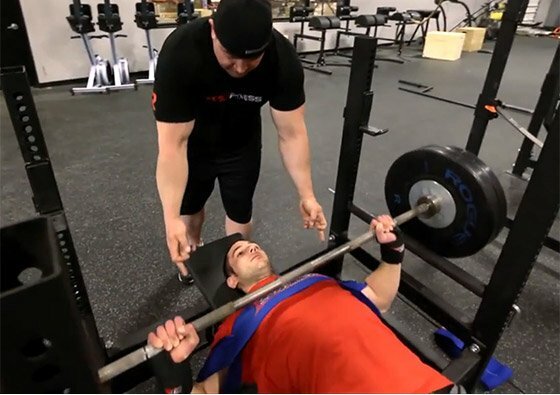 Experienced lifters will note that these three techniques are commonly used by powerlifters who use bench shirts, but they're highly beneficial to the raw lifter as well. Use these movements as your primary exercises for two weeks at a time and then rotate to a different one. For example, use the board press as your main movement for the first two weeks, then move to bands, then the Sling Shot, and finish your final two weeks using a straight-weight raw bench press. After two months of overload, speed training, and heavy partials, it should be relatively easy to establish a new PR on the bench press. Rather than just inserting these techniques into your workout on chest day, let's focus on bringing up your bench by making some large-scale changes to your routine. Incorporate the workout below into your regular program, removing chest and triceps from your current routine. This means you'll have two days per week dedicated to the bench press—a max-bench day and a dynamic effort day—and probably 2-3 days to cover legs, back, shoulders and arm work. I suggest you slightly reduce the volume on shoulders and arms while you focus on your bench press. For main movements, follow the prescribed intensity, which is expressed as a percentage of your one-rep max of your bench press. For accessory work and assistance movements, use a load that would result in failure by the prescribed rep target. Use 2-3 boards, or if using a power rack, set the safeties at your sticking point—about midway through the range of motion. Set the safeties in the power rack to the bottom of the range of motion, coming to a dead stop on each rep at the bottom by allowing the bar to momentarily settle on the pins on each rep. Utilize a Sling Shot on the last three sets of your bench press regimen. Take three attempts at 100% of your max to determine your progress. Your first attempt should be your previous 1RM, a weight you should now be able to handle. On your second attempt, aim for an increase of about 5% more than your previous best—just make sure you get a spotter. On your last attempt, go for the moon, adding another 5-10% more weight on the bar to set a new PR.